Today’s post is our third visit to the the Science of Retirement Conference 2018, which was held in London recently. 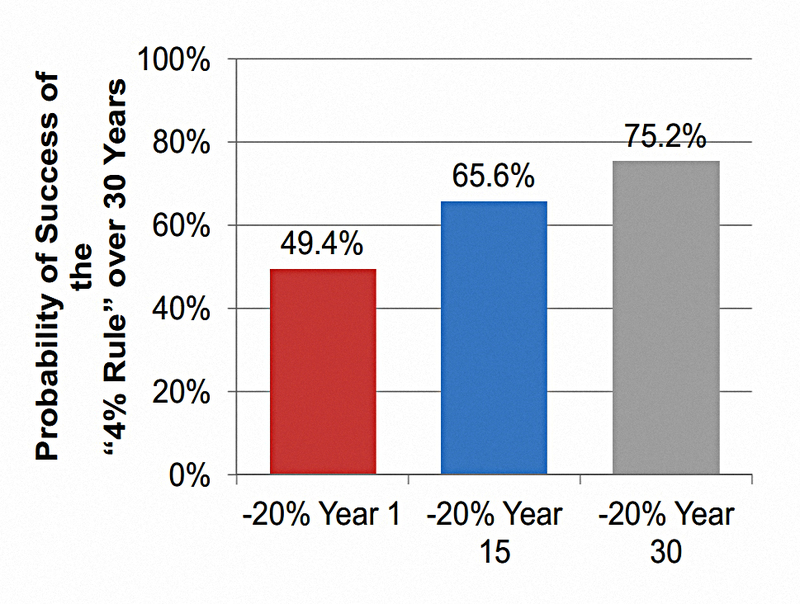 This time we’ll be looking at Morningstar’s take on the 4% rule. 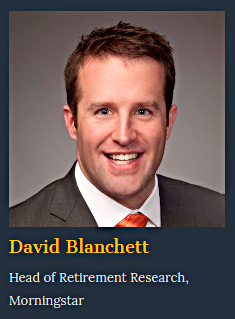 The second presentation of the day was by David Blanchett of Morningstar. 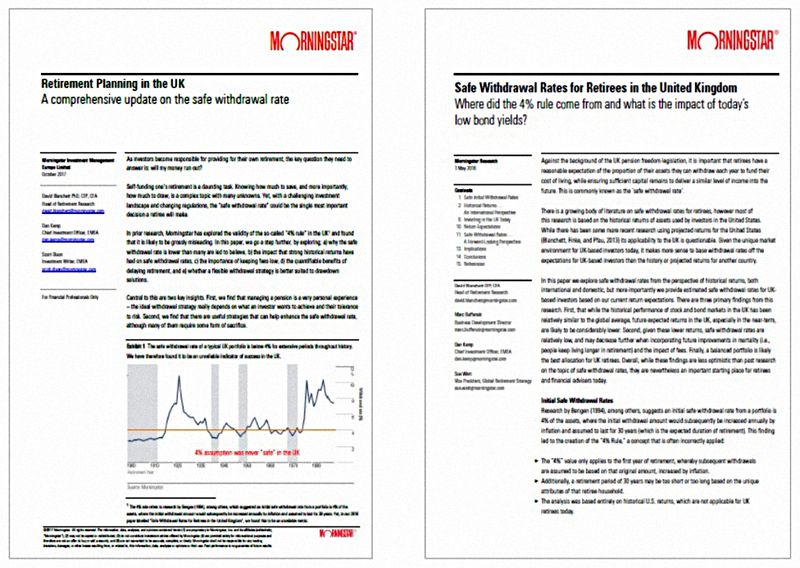 The talk was titled “Successful Withdrawal Strategies for UK Retirees” and was based on two Morningstar white papers that he co-authored. 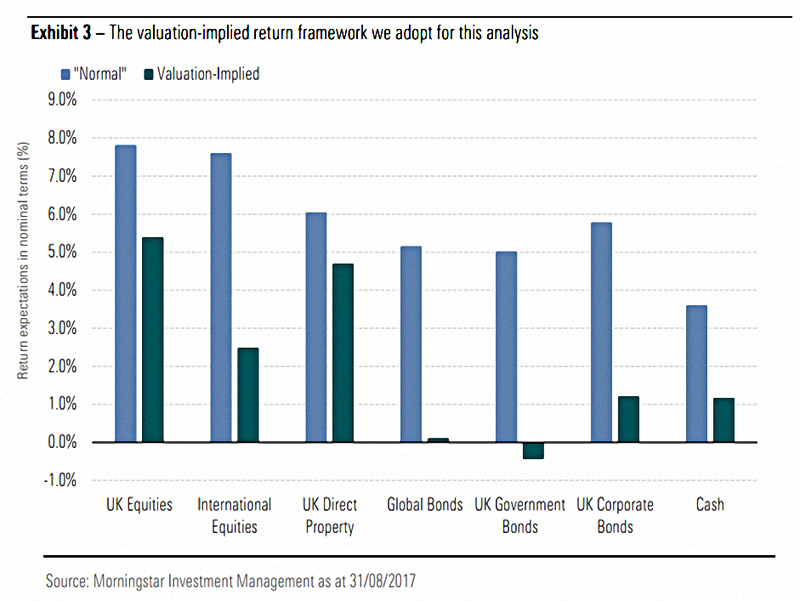 In practice, David looked at whether the 4% rule was still valid in the light of current market and economic conditions. I’m going to try to bring together the two papers (written in 2016 and 2017 respectively) with David’s slides from the conference. Since I’ll be using charts from three sources, the numbering could get a little confusing, so bear with me. Before I get to the underlying papers, let’s look at a few slides from David’s presentation that were not directly related to the 4% rule. He actually put most of these at the end of the presentation, but I think that they sit better at the start. 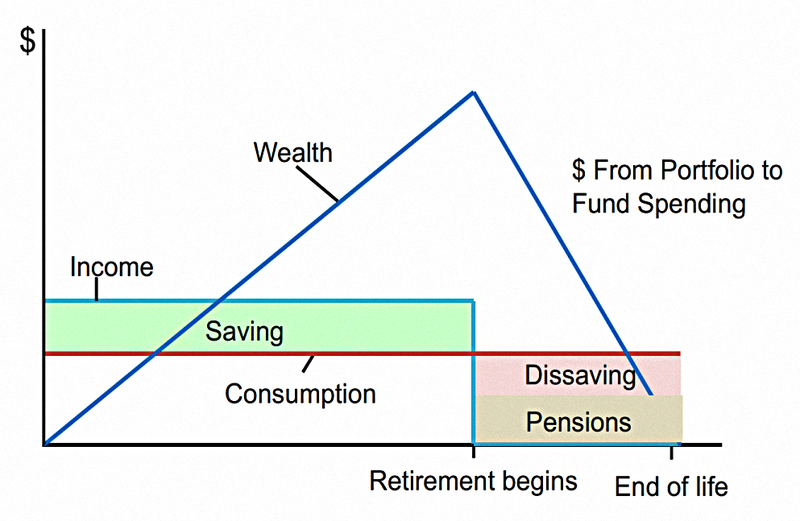 you spend money (dissaving or decumulation) in retirement. Few people will get things exactly right. The main choice is between running out of money too soon, or leaving some money behind. The only true failure is still being alive, but having no money left. 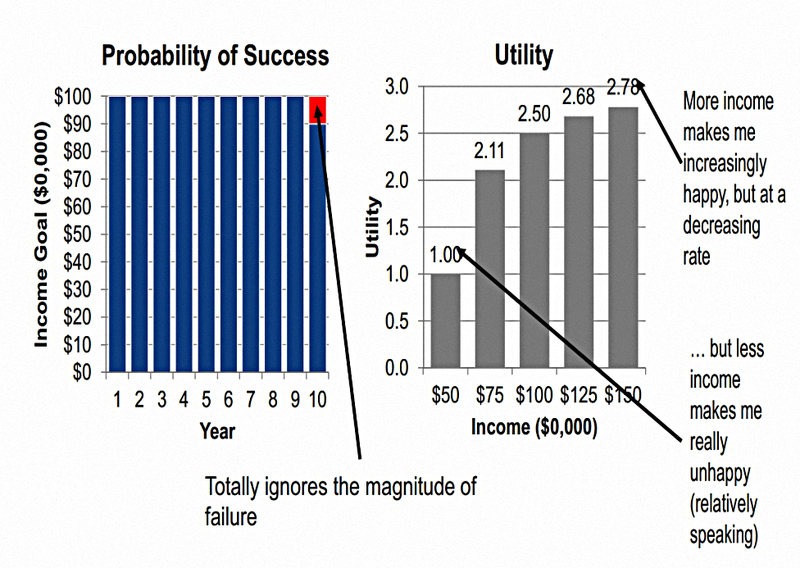 In this chart, David compares success with utility. The success rate of a strategy (as defined in retirement planning) is the percentage change of a pot lasting for a predefined length of time. 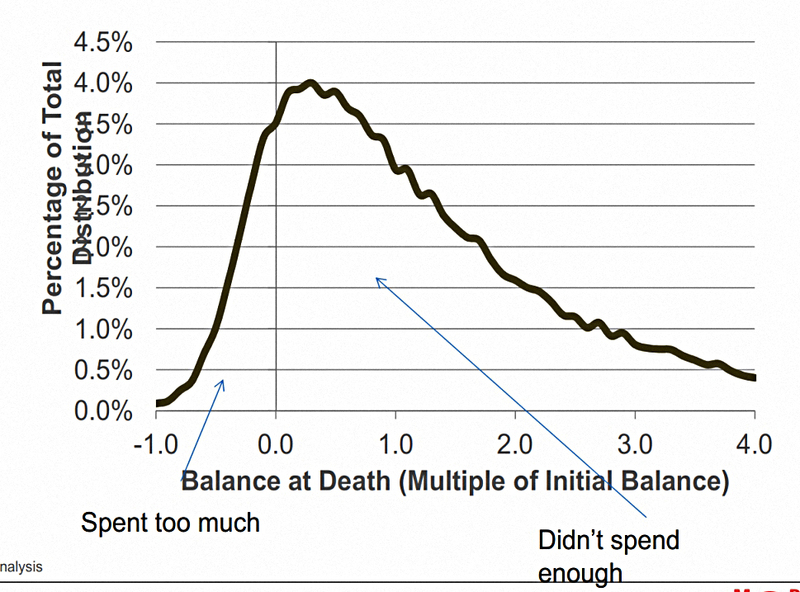 More money makes us happier at a decreasing rate. But less money than expected (or none at all) gives us a much bigger problem. 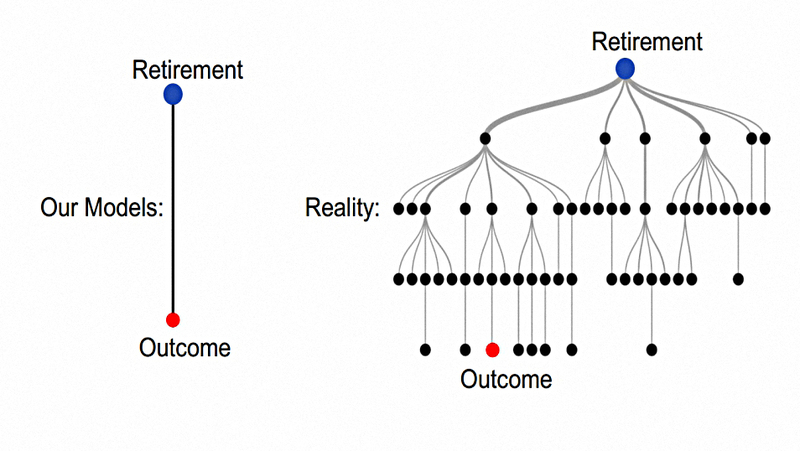 Rather than make one big decision at the start, it’s an iterative (usually annual) process, as we gradually find the best path through a complicated decision tree. The next chart shows that rebalancing process in more detail. 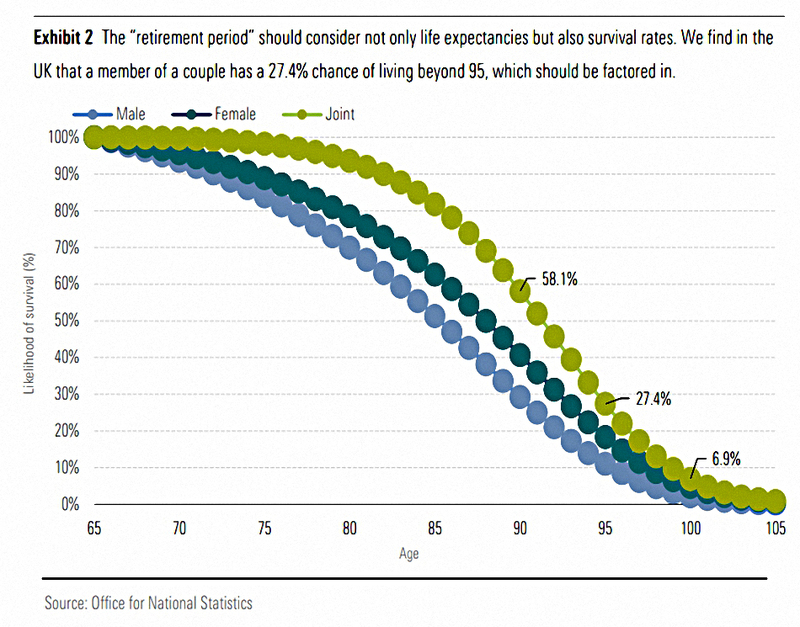 This chart shows that if you ask people whether there is a crisis of retirement outcomes, many or most of them will say yes. But if you ask them whether they have a personal crisis, they will say no. This is particularly true of people who have already retired. On to the first of the papers – the more recent one. 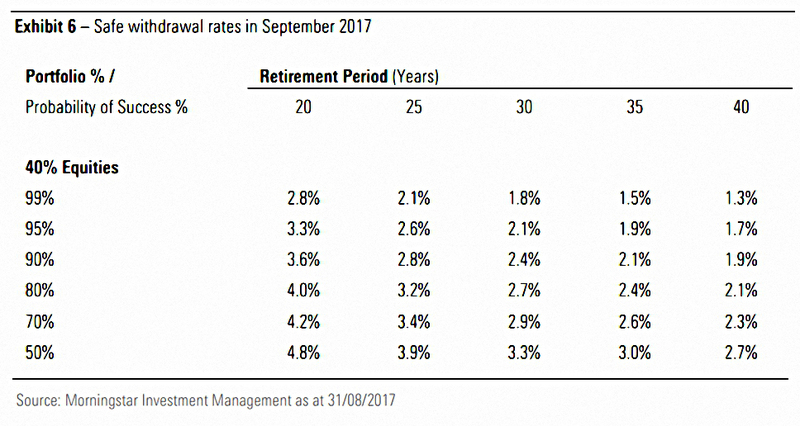 Retirement planning in the UK is from October 2017. Whether flexible withdrawals can help. You take 4% of your initial pot at retirement as cash in the first year. In subsequent years you raise this amount only by inflation. 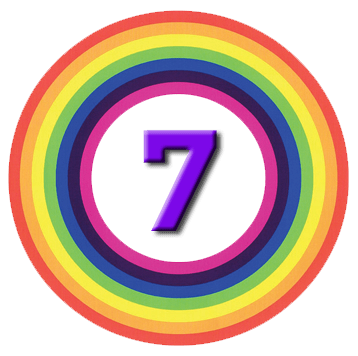 The 4% rule is easy to remember, and implies a nice round number – 25 times your required income – for working out when your portfolio is large enough for you to retire. The 4% rule is a backward-looking rule. 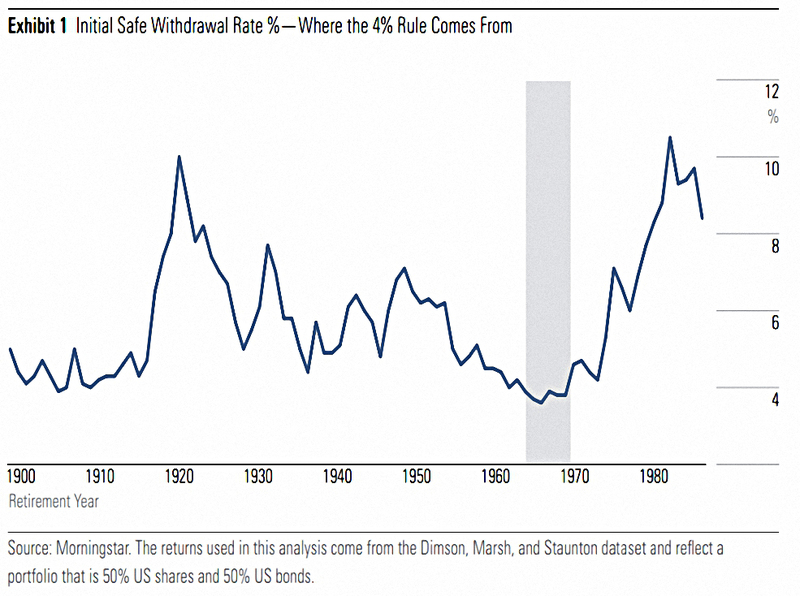 For most of the twentieth century (in the US), 4% was a safe withdrawal rate (SWR) for a 50% US stocks / 50% US bonds portfolio, with a 30 year time horizon and a 95% target certainty. 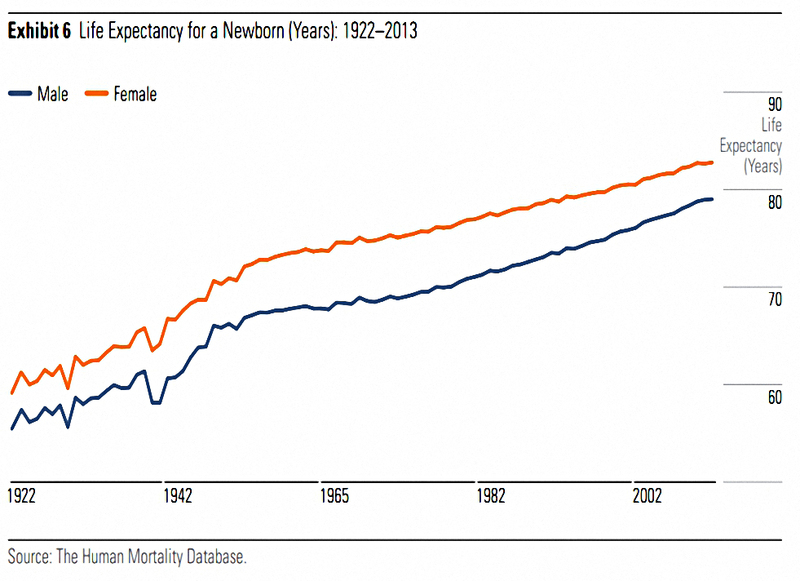 Even in the US, 4% was not an SWR during the 1960s (shaded portion of chart above). 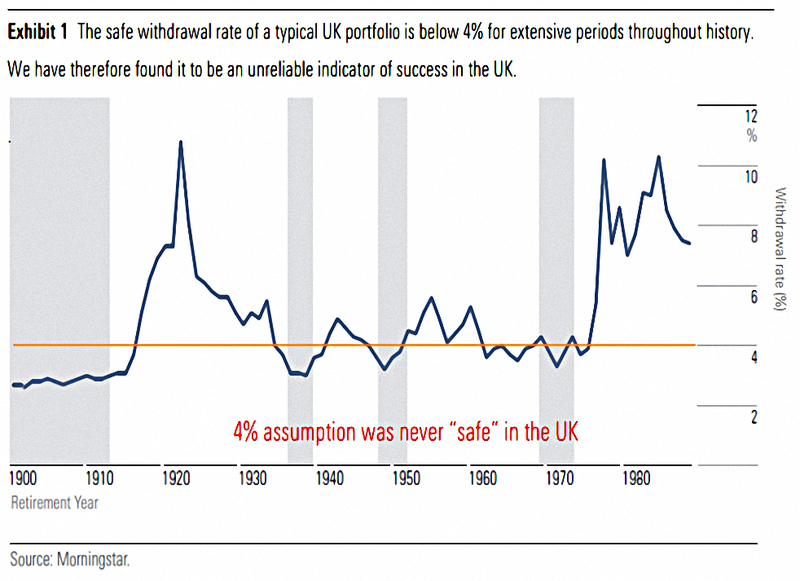 Here in the UK, 4% was never really a safe withdrawal rate. If the initial research had been carried out here, it might be known as the 2.5% rule. 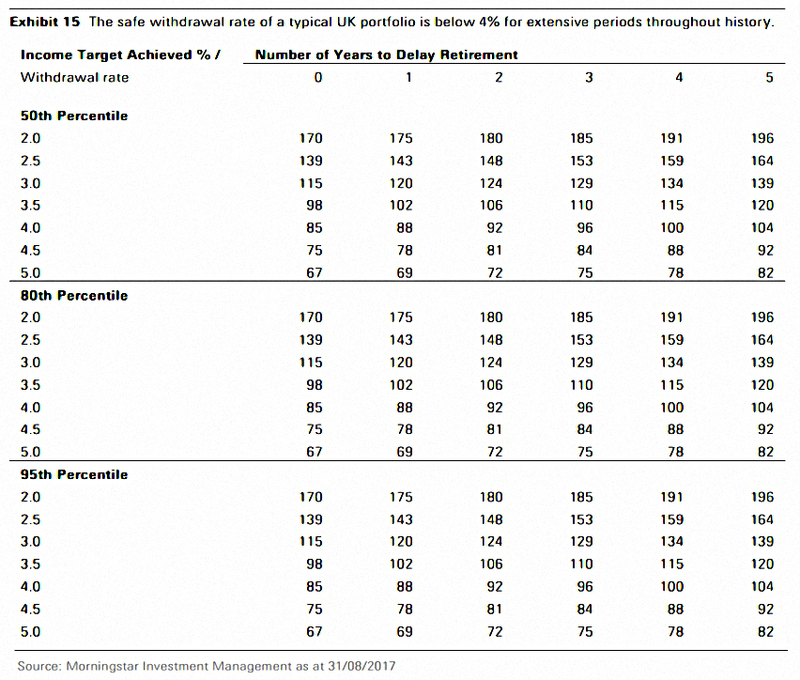 This in turn implies that a pot of 40 times income is needed to safely retire. 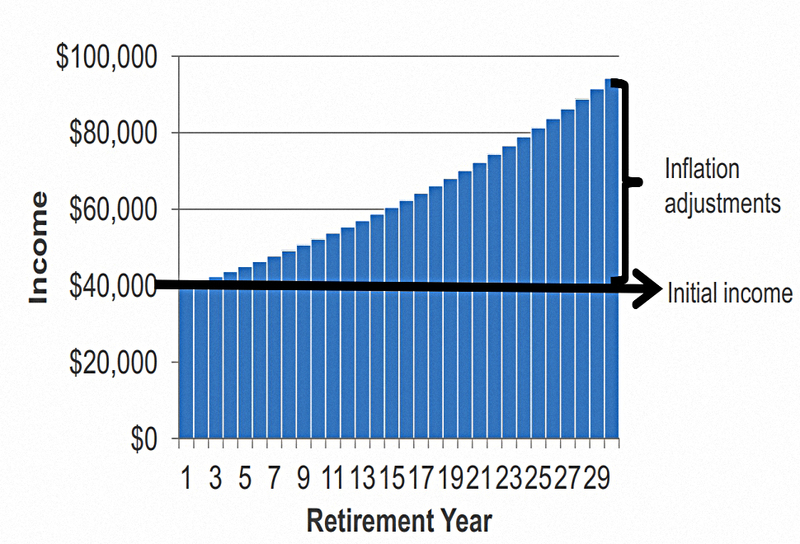 The extent to which the retiree has a secure retirement income (a state pension, or an annuity). Or a cash buffer to ensure that market downturns can be waited out. 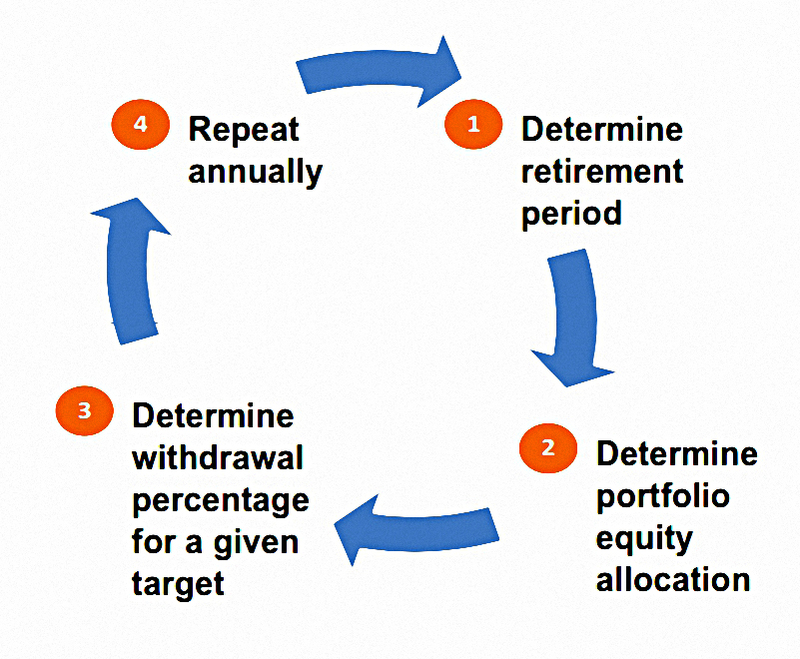 And sequencing risk, or the problems faced by a retiree whose portfolio falls in value in the first years of retirement. We also need to be clear on whether any particular analysis is based on numbers from the past, or projections for the future. 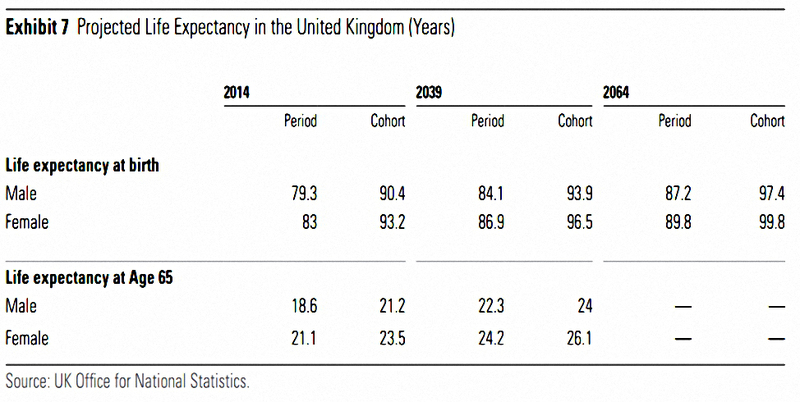 UK life expectancy has clearly increased significantly over the past century. 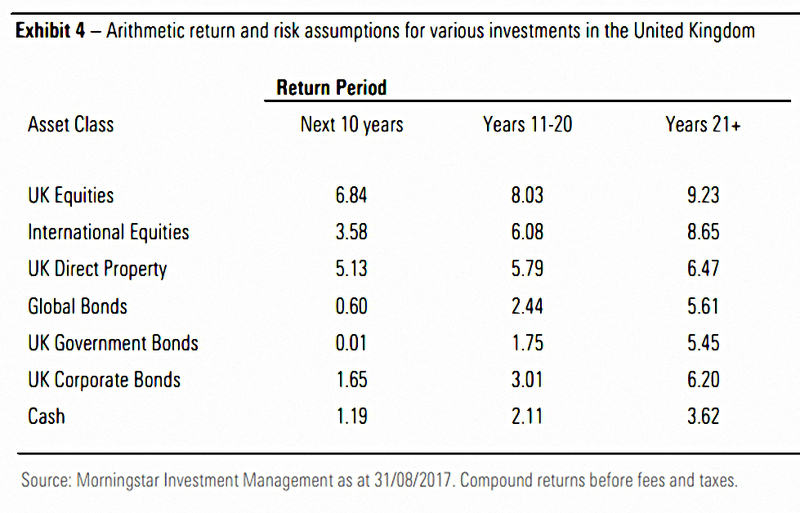 The 2017 paper uses the above projected return rates, which are compared to the normal (historic) returns for each asset class. These numbers had fallen since the earlier (May 2016) paper. This chart shows the deterioration for a 40% equities portfolio. And here are the implied SWRs as of September 2017. 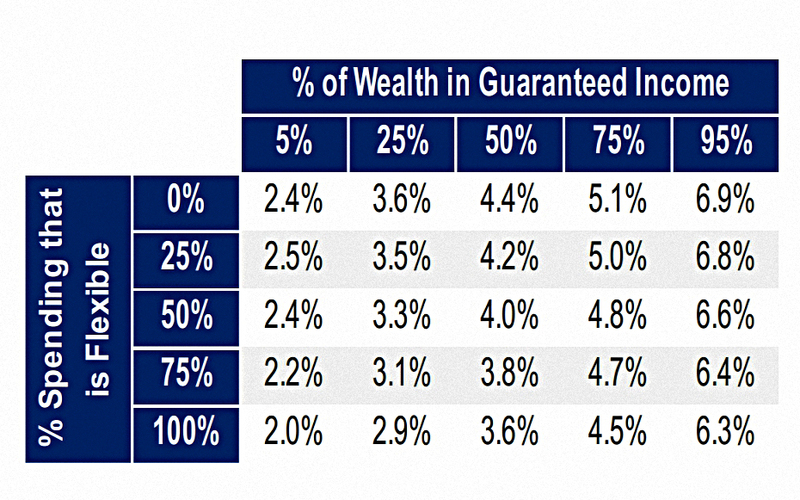 They are low (2.1% for 95% confidence of lasting for 30 years) but that reflects the low equity content of the portfolio (40%). Fee minimisation could be the single most important variable to increase the SWR for retirees. The portfolio has longer to grow. Fewer years of withdrawals will be needed. 95% confidence (30 years) requires 2.5% pa withdrawals and a 5 year delay. Or 2.0% pa withdrawals with no delay. You will recall that the the SWR for 40% equities (30 years, 95% confidence) was close to 2.0% pa (actually 2.1% pa). Increasing equities to 60% leaves this SWR at 2.1% pa. 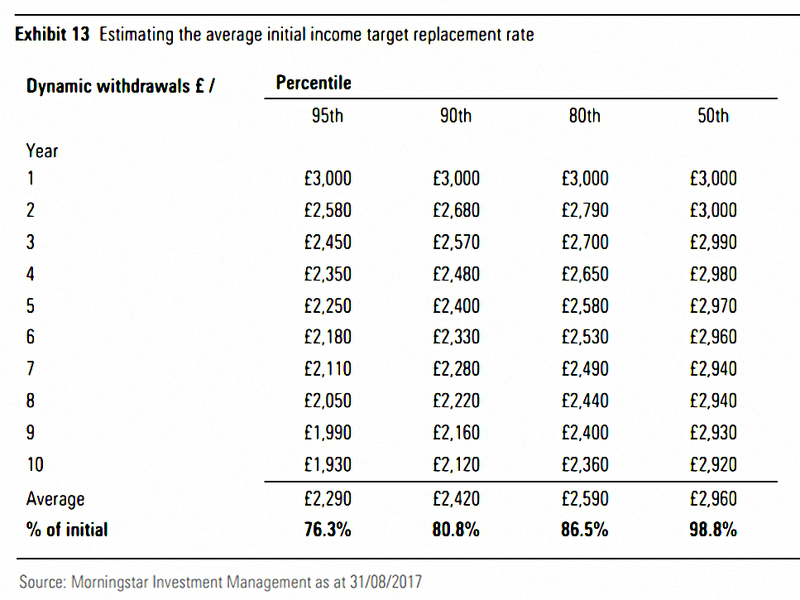 Worse still, increasing the equity allocation to 80% or 100% actually reduces the SWR. And for 0% or 20% equities, this SWR rises to 2.2% pa. I am surprised by this result and it warrants further investigation. By dynamic withdrawals, Morningstar don’t mean the floor and ceiling approach we discussed when looking at the Vanguard lecture from SORC 18. 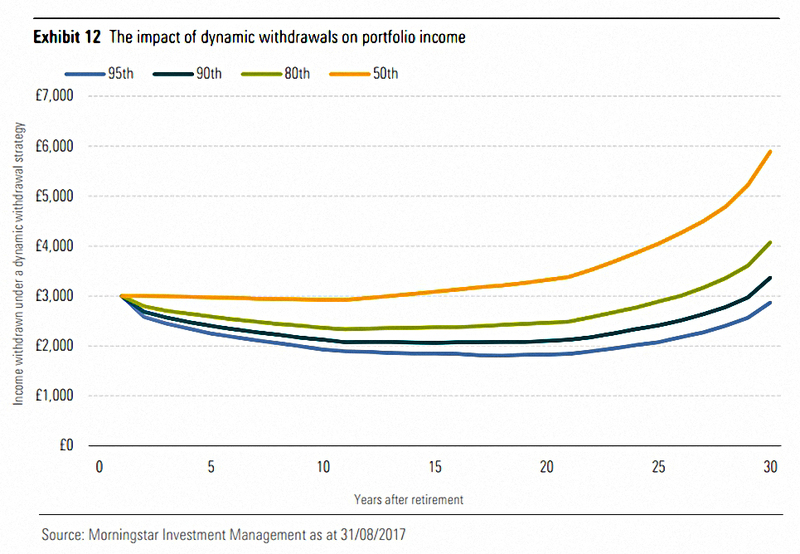 Rather, they mean a constant SWR in percentage of portfolio terms – where the cash amount withdrawn is proportionate to the portfolio balance at the start of the year. Here the 80th percentile is the worst 1 in 5 runs of the model, and the 95th percentile is the worst 1 in 20 runs. 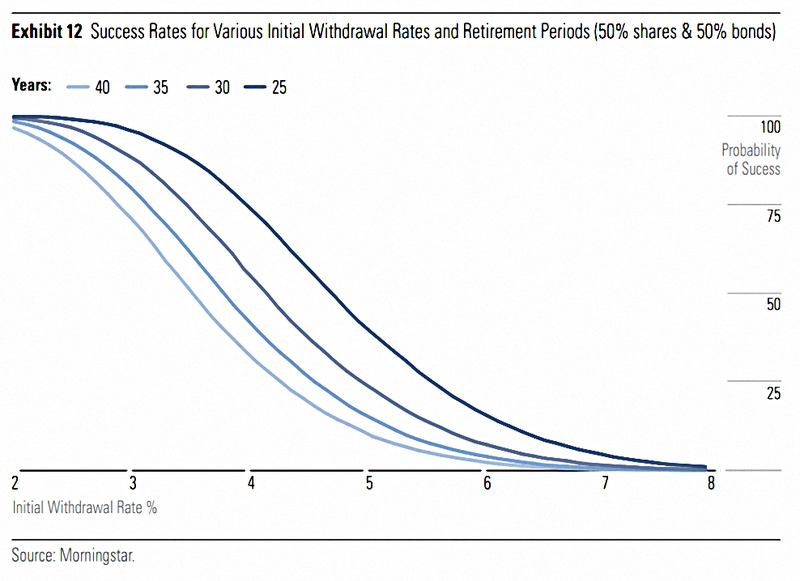 A 3% pa initial withdrawal rate was chosen, but only the best 50% of runs stay above that level..
At the 95th percentile, a large part of retirement is spend at less than 2% pa withdrawals. But they don’t run out of money completely. Since the withdrawal is a fixed portion of what remains each year, that is impossible. This means that the best measure of “success” for this approach is the percentage of the initial target income that is actually withdrawn. Even at the 95th percentile, a retiree receives more than 76% of the target income over 10 years. 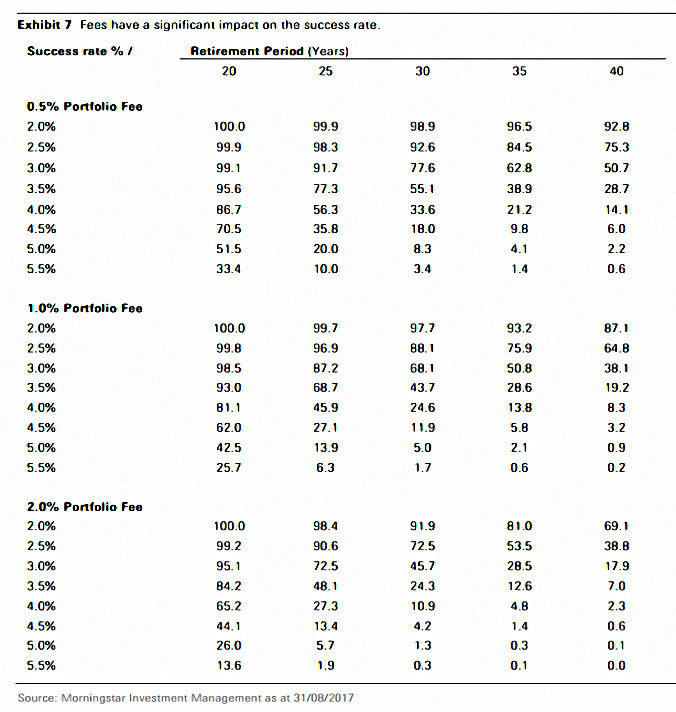 The table above shows the income results for the 40% equity portfolio, over 30 years, with a 1% annual fee. Again, for confidence at the 95% level (95th percentile) we need to stick with a 2% pa SWR. The dynamic approach degrades more gracefully than the fixed SWR (you can’t run out of money). But it doesn’t boost the initial safe rates. 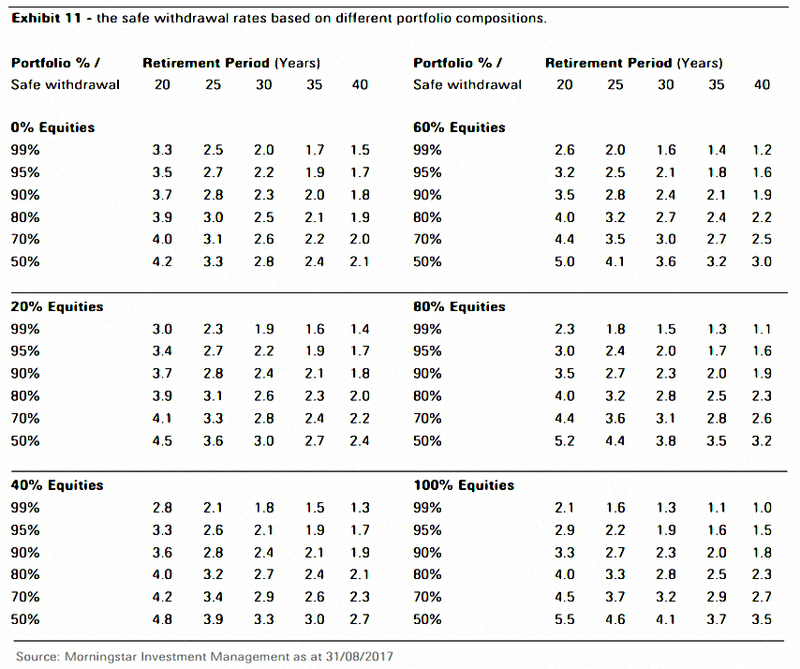 This table is suppose to cover the same 40% equity portfolio over 30 years with a 1% annual fee. 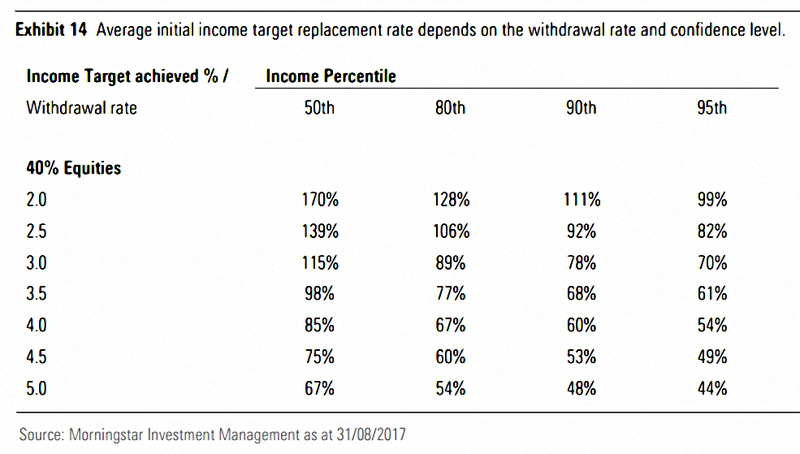 I’m obviously missing something, because at the 95% percentile, the result from zero years of delay and a 2.0% withdrawal rate is now 170%, rather than 99% as in the previous table. This table makes it appear that dynamic withdrawals support a 3.5% SWR at the 95th percentile. And that’s it for the first (latest) paper. On we go to the second, older paper, which is from May 2016. 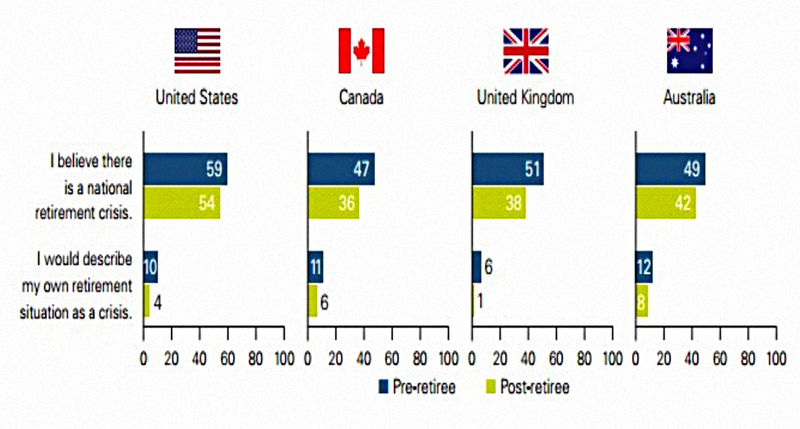 There’s a nice table of SWRs at various confidence levels for many countries (30 years, 50% stocks, 1% pa fees). 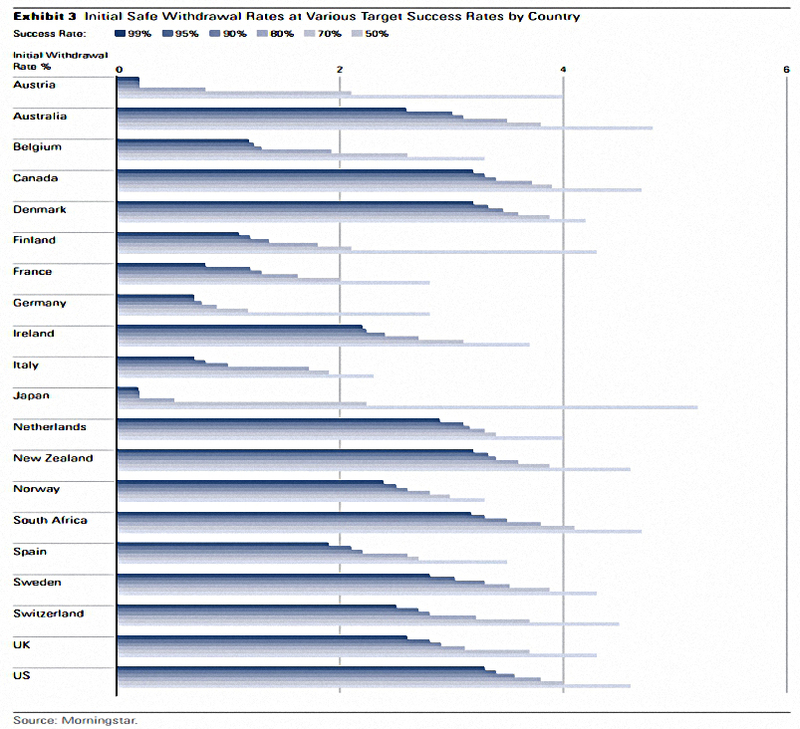 US SWRs are the highest across 20 countries. 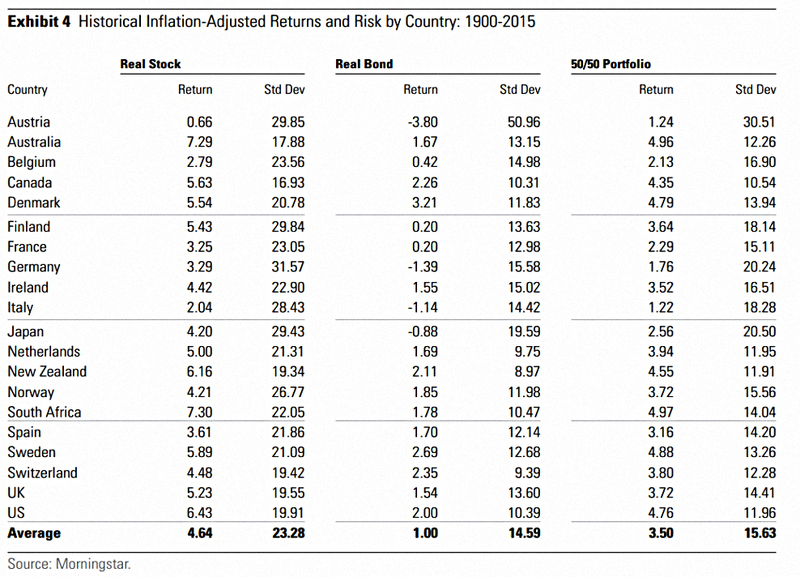 The UK SWR at 95% confidence is 2.8% pa.
There’s also a table of inflation-adjusted returns by country. 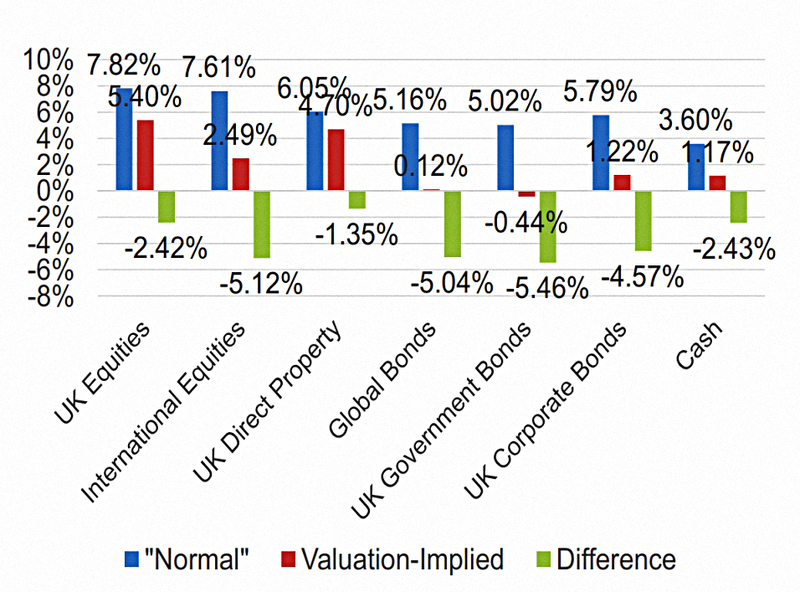 Here’s a table breaking down how Morningstar forecast returns for stocks and fixed income. 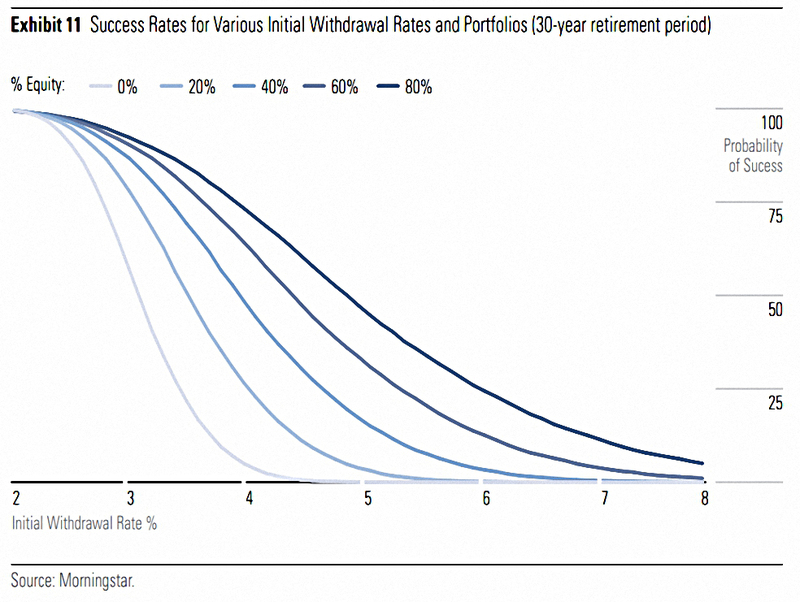 This chart shows the success rate for various withdrawal rates and confidence levels over 30 years. This shows more clearly how higher levels of equities have little impact at higher confidence levels. 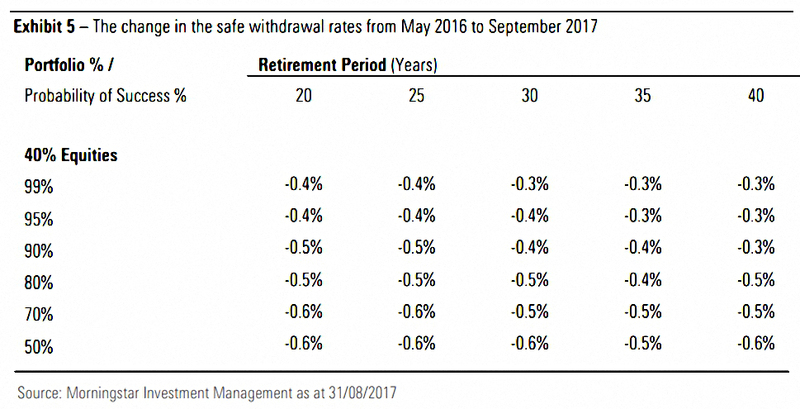 This chart shows the results for a 50% equities portfolio over various retirement periods, confidence levels and initial withdrawal rates. 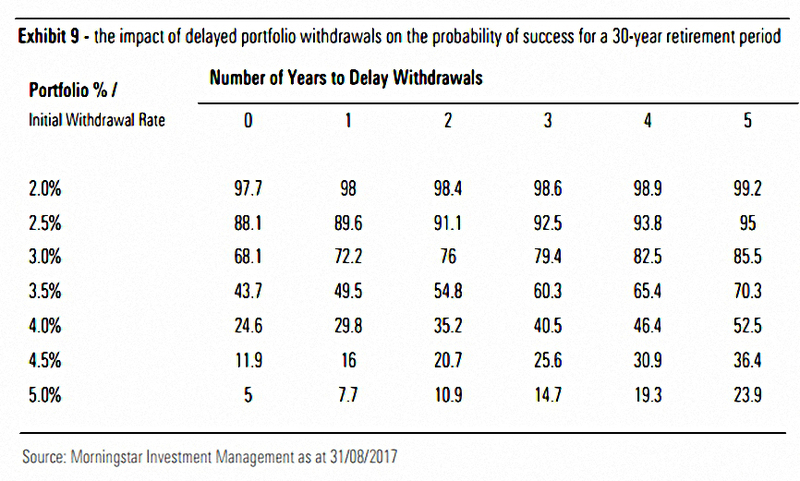 Once again, a 3% pa withdrawal for 30 years at 95% confidence is not available. There are a few more slides from David’s presentation that aren’t covered in the papers. 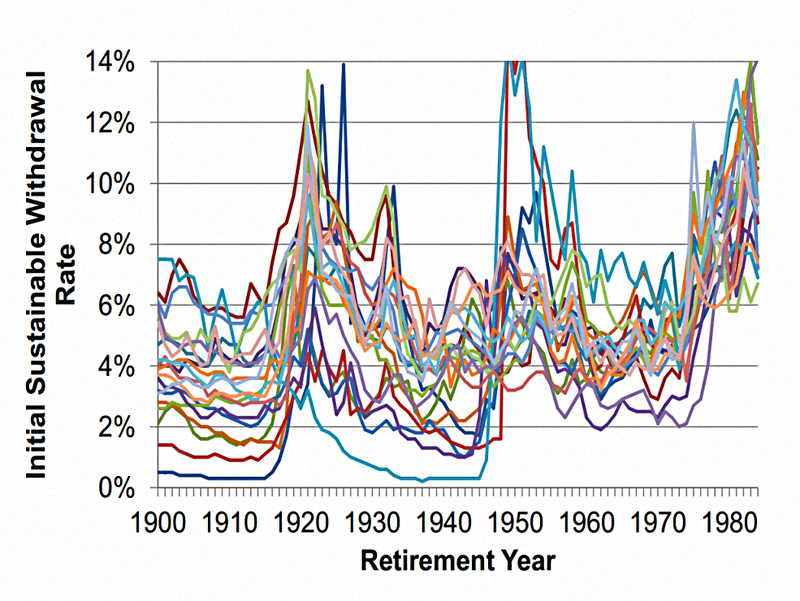 This one shows the high variability of SWRs by country and year of retirement. 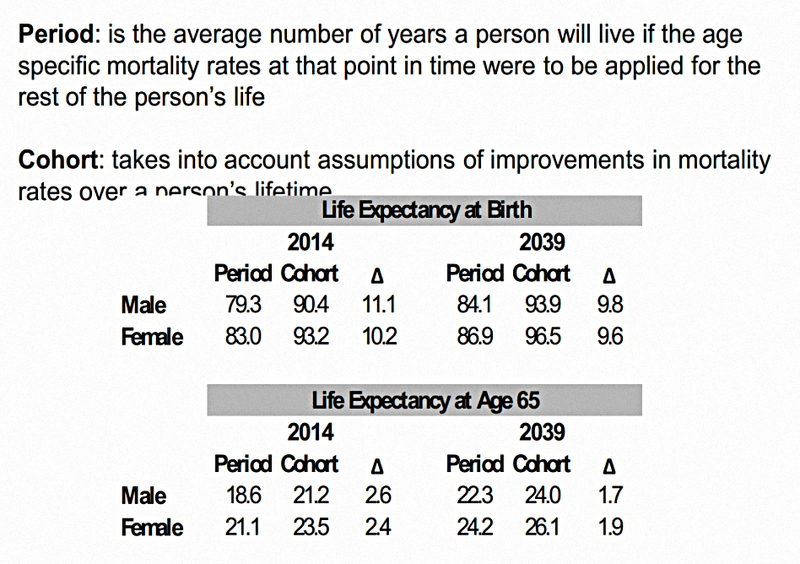 The slide shows the cohort effect of life expectancy, where future improvements in mortality during a retiree’s remaining years are taken into account. 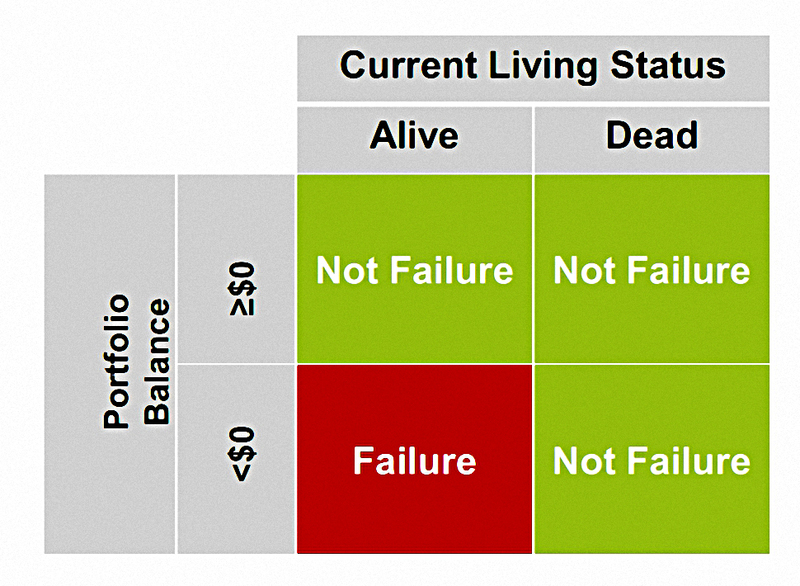 This chart looks at sequencing risk by imagining the impact of a single year with a 20% loss. If the loss happens in year 1 it has a major effect. By year 30 it has no impact. The final slide introduces the concept of guaranteed income (from state pensions or annuities) and its effect on SWRs. For a given degree of flexibility in spending, more guaranteed income means a higher SWR. What I don’t understand is why increasing spending flexibility implies a lower SWR for a fixed level of guaranteed income. David’s presentation was very interesting, and more upbeat than the published papers. Going back to the original papers has in many ways increased my understanding of the issues, but I don’t understand why higher equity allocations don’t raise the SWR. And I can’t reconcile the “zero years of delay” dynamic option with the standard “no delay” dynamic option. I’ll try to get in touch with David to clear up these points, but it’s clear from the papers than a 4% SWR is not appropriate for the UK today (indeed, it never was). and, under certain circumstances, taking more risk through a higher portfolio allocation to equities. Flexible withdrawals are probably the easiest strategy to implement, and the safest. I’ll be back in a couple of weeks, with our final visit to SORC 18, which covers Abraham’s presentation. Big shots are only little shots who keep shooting. Today's post is about an event I attended a few weeks ago, on the topic of moving to Portugal.